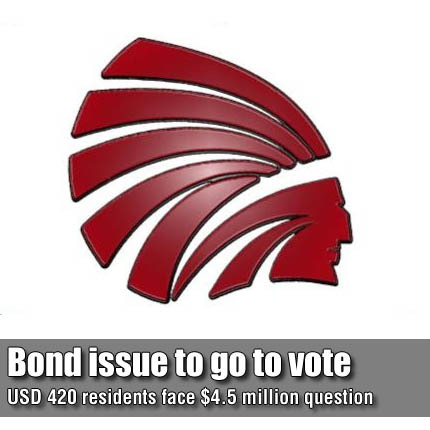 OSAGE CITY—The USD 420 Board of Education began the 2011-12 school year with the appointment of officers and representatives, along with passing a $4.5 million bond election resolution for school improvements. The bond follows long term planning for capital improvements and renovations to the district’s facilities, including additions, safety and technology improvements, construction and installation of a running track and football field at Jones Park and related improvements at the facility. The board unanimously agreed on a motion by USD 420 Board Member Cindy Cook to approve Resolution No. 2011, authorizing the calling of a special question election for a $4.5 million bond for educational capital improvements, pursuant to KSA 72-6761 and KSA 2315. The motion passed 6-0 with board member Todd Petterson absent for the vote.